CLEMSON, SC – Clemson has been named the National Team of the Week of College Football for its 35-30 win over Florida State on September 24. It is just the second time Clemson has been the recipient of the award from the Football Writers Association of American. The FWAA has given the award on a weekly basis since 2002. Clemson downed the 11th ranked Seminoles to give the Tigers a second win over a top 20 team in eight days. On September 17 Clemson defeated 19th ranked and defending National Champion Auburn. Clemson gained 443 yards and scored 35 points against Florida State, who entered the game fifth in the nation in total defense, allowing just 195 yards per game. The Seminoles had also allowed just 11 points per game entering the contest. Tajh Boyd completed 22-35 passes for 344 yards and added 19 rushing for 363 yards of total offense. His favorite target was freshman receiver Sammy Watkins, who had seven catches for 141 yards and two scores. Defensive tackle Rennie Moore had a sack on Florida State’s final offensive play to preserve the victory, Clemson’s fifth in a row over the Seminoles in Death Valley. Clemson held Florida State to just 29 yards rushing. 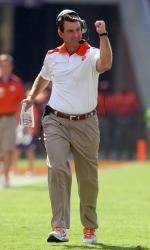 Clemson last won the award from the FWAA in 2003 after a 26-10 victory over a third-ranked Florida State team. That is still the highest ranked team Clemson has defeated in its history.